The Renaissance art historian and collector of contemporary art Thomas Frangenberg died on 12 March at the age of 60. After studying art history, archaeology and early Christian archaeology at the University of Bonn, he received his PhD from the University of Cologne. He had also had an association with the Warburg Institute with a Yates Fellowship there in the year 1989/90 just prior to his appointment as a lecturer at the University of Leicester between 1990 and 2017, latterly as a Reader in Art History since 2008. Widely published, he was an authority on Italian, French and German writings on art, architecture and perspective from the 16th and 17th centuries, although his interests were always moving in focus – more recently 18th-century art history in Moravia and the 19th-century Romanian painter Theodor Aman came under scrutiny. Similarly his teaching at Leicester encompassed modules from ‘Sculpture by Michelangelo and his Contemporaries’ to ‘Conceptual Art and its Aftermath in Britain’. His collection began, as it continued, as a result of being able to have conversations with contemporary artists – about their motivations, interests and concerns, or even about particular works – whereas it obviously wasn’t possible to have similar conversations with Michelangelo. Talking with contemporary artists (and living with contemporary art) also gave him the chance to engage with art in a more fundamental way, unconstrained by the demands of academe. Conversations with and then buying work from any artist is an uncompromising declaration of support, especially when the purchase is organised on the basis of payments of £100 a month, friendships and understandings ensued. Thomas wrote about the artists he was interested in, especially for exhibition catalogue introductions. 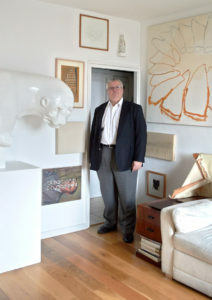 His knowledge, contacts and friendships proved invaluable when he was asked to acquire works on behalf of the Contemporary Art Society distribution scheme for the year 2001/2. All the works he sought out now have their place in museums around Britain, and although – with the exception of Amikam Toren – it omits artists from an older generation who had a significant place in his collection (especially John Hilliard and Tim Head, as well as Stephen Willats, Marc Camille Chaimowicz, Keith Milow and Paul Neagu), the list of artists he bought for the CAS also reflects in microcosm one slice of his collection: Shahin Afrassiabi, Fiona Banner, Matt Calderwood, Angela de la Cruz, Keith Farquhar, Liam Gillick, Luke Gottelier, Brian Griffiths, Nicky Hirst, Henry Krokatsis, David Musgrave, Seamus Nicholson, Shez 360, Jemima Stehli, Mark Titchner and Amikam Toren.